Wedding Advice: Is doing a first look photo right for your wedding? This is a guest post by our friend Emily Reiter of Anna Delores Photography. 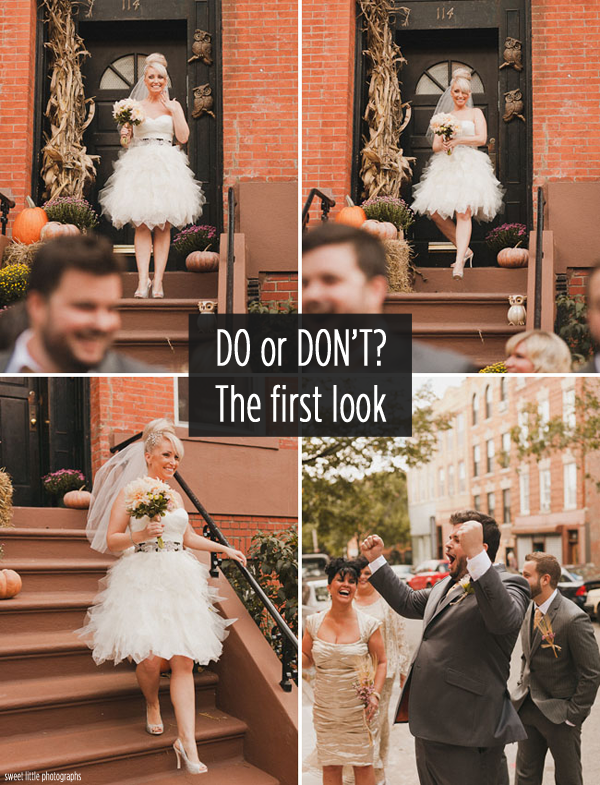 The “first look” photo has become a pretty common standard for modern weddings. The tradition of couples not seeing each other before the wedding ceremony was established a long way back with the practice of arranged marriages. Weddings used to be primarily a business deal between families. The idea was that if the bride and groom (who hadn’t met prior to the wedding day) saw each other before the ceremony itself, they still had a chance to back out. The bride’s veil accomplished the same end goal, preventing the groom from seeing her (and thus determining whether she was attractive!) until the last possible moment, which kept the groom from changing his mind. This is obviously old-school. So why do we still do it? 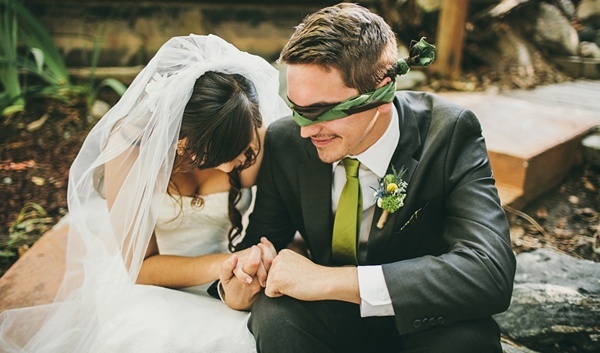 There are a LOT of wedding traditions we’ve kept around for the sake of tradition itself. Really, weddings themselves are quite the traditional affair, with social (and often religious and/or cultural) significance, even as some logistical and economic origins of marriages have decreased or even disappeared entirely. As a wedding photographer, I’ve seen a variety of implementation of wedding traditions. Some couples insist on everything from the receiving line to the bouquet toss to saving the top layer of their wedding cakes for their first anniversary. Others, however, have opted to skip some of these customs, dismissing them as antiquated and irrelevant in modern marriages. In the process, new traditions have materialized. Like the first look! These days, the couple doesn’t need to hide from each other pre-ceremony for those old-school reasons they used to, but the drama of the bride and groom seeing each other for the first time on the wedding day still holds serious appeal. The photographer’s assistant or a helpful member of the bridal party stages the groom (usually in a spot with a lovely backdrop for photos) to face away from the direction from which the bride will be walking. The bride, once assured the groom is ready and “in position,” sneaks up behind him and usually gives a tap on the shoulder or other signal that it’s time to turn around. The groom turns to face his wife-to-be. It’s a private moment, minus the presence of the photographer and maybe the bridal party watching from a short distance away, for the two of them to say hello, relieve some of those wedding-day jitters, and hug it out. In my opinion, the best ones involve tears (even though many brides and their makeup artists would disagree with me). Really, I’m a sucker for an emotional groom. So what are the perks of doing a first look? I've always thought the idea of first look photos is a really lovely one: you have a moment to yourselves, instead of in front of your entire guest list, to see each other for the first time on your wedding day. You’re keeping the drama of the whole “wait to see each other” concept without conforming to the tradition of seeing each other only when the ceremony commences. EVERY couple I’ve worked with who has opted for a first look expresses the relief of their nervous energy before walking down the aisle. There’s still the excitement of getting married, but if you’re prone to serious anxiety, a first look might be a great way to calm down before ceremony time. And don't worry; you still get the impact of seeing each other for the first time on your wedding day! Sometimes couples are concerned that they'll be losing the "wow" factor of seeing each other for the first time as the bride walks down the aisle. But you're still about to get married. It’s a HUGE moment no matter how you approach it! I also really love first look photos because it alleviates a lot of the pressure to take a ton of portrait photos in the time crunch post-ceremony, which means you get to hit up your reception (i.e. PARTY DOWN) a lot sooner! Another perk? You'll get to your party faster and thus feel less rushed and less stressed. The photos you have to take during the cocktail hour will diminish significantly if you can take bridal portraits as well as bridal party photos before the ceremony instead of trying to squeeze them in with all your post-ceremony family portraits. And minus the possibility of tears, your hair and makeup also look fresher for pre-ceremony bride and groom portraits after the first look. It's a lot better than waiting until after the ceremony, family photos, and (if applicable) travel to your reception venue to snap shots with your brand new spouse. Lastly, if you are having a late afternoon/evening ceremony but would like to snap some portraits in natural light (which I am in HUGE favor of), a first look is a great way to do this. And, if you still really, really want to wait for the ceremony to see each other for the first time, you can still take first look photos if you want to! There is no shortage of cute ideas for taking photographs together without actually seeing each other (or your photographer might have great ideas -- let him/her exercise some creativity). What do you think of doing a first look? Are you planning to do one for your own wedding? About Emily: Emily is a wedding photographer and the artist behind the lens at Anna Delores Photography. Anna Delores Photography is about images inspired by photojournalism and is fueled by coffee, a Canon 5D Mark III, and an insatiable urge to document magical moments in people’s lives. Emily thrives on sun-kissed, ethereal images, and opportunities for candid, spontaneous moments caught on camera are her favorite.